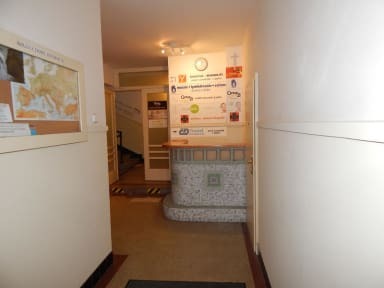 Hostel Delmedio is located in a great location, in the historical center of city near Wenceslas Square. You will be staying in a beautiful historical building from 16th century which represents the Czech History. We offer you: Guest Kitchen, Free Internet Access, 24 hours Reception, Airport pick up against a fee, common room to relax, bike parking and a travel desk. Wenceslaus Square is the center of business and cultural communities in Prague. 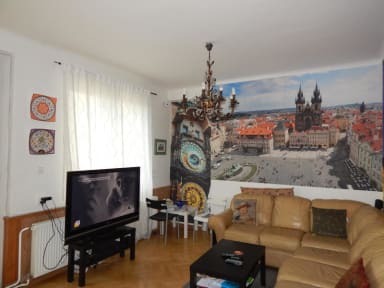 It is within a short walking distance of all the major sights of Prague, such as well-known Charles Bridge, The Astronomical Clock and many others. The hostel is surrounded by many coffees, restaurants, bars, clubs, pubs and great shops. We are always willing to help with general information such as Prague tour etc. The hostel offers a deluxe private room with a king size bed. We offer female and mix dorms as well. All dorms are with beds with comfy mattresses and big fluffy pillows. Super good location, though a little bit hard to find at first because the Name is written in a very small way upon the door, I walked twice by it without finding the entrance..but maybe its just me :)The staff is very kind and supportive. Otherwise very very simple but clean. One night totally fine! Das Frühstuck war enttäuschend, die Mitarbeiter sind sehr freundlich. It was horrible.DIRT was everywhere.There were only two bathrooms for the hostel wich means you should wait one hour to go in,and they weren’t once cleaned. Disgusting.